FUE is the most advanced procedure of hair transplant which is popular with the various names with the difference of small variants but the beat of them is the unit by unit technique. Dr. VJ’s centre Visakhapatnam is the pioneer in the unit by the unit technique that gives the optimized results after surgery. 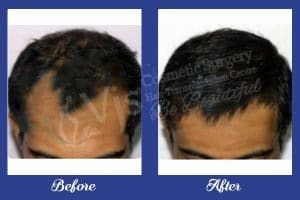 This technique offers the surgeon to transplant the maximum amount of the hair with the minimized amount of the nation- hair-bearing skin. So this technique facilitates the quick healing after surgery and the tiny scars and implantation of the more number of grafts. After this technique, the results appear completely natural. This procedure demands the specialized and experienced surgeon so that the safest surgery with the optimized results can be performed. Before the surgery, a patient has to attend the pre-surgical session in which his candidacy for the procedure has been examined. A person must have the realistic expectations from the procedure. If you are an ideal candidate for this advanced technique then the next step is determining the donor area on the basis of the quality and quantity of hair follicles. Generally, hair on the back of the head remains resistant to pattern hair loss so this area is selected as the donor area for the surgery. Then the design of the hairline has been created by the experts so that most possible outcomes meeting to your requirements can be given to patient. The surgeon sketches sample for the placement of hairline to make you aware about the procedure and possible outcome after surgery. In the last step of surgery unit by unit follicles are implanted at the adequate distance, depth and the angle so that natural appearance can be given to patient after surgery. After the procedure, the patient can get back to home and on the 3rd day, can resume his activities except for the heavy exercises, dangerous sports that can cause injury or can damage the transplanted hair. Patient has been giving special instructions about the post-operative care as the care after surgery can add to its results positively. So with this advanced technique patient can have completely natural hair with improved younger and smarter look at the only justified unit by unit technique cost in Vizag.